If we were to ask our kids or teens about what traits or actions make someone a hero, we would probably hear replies ranging from superheroic feats to everyday people who demonstrate outstanding acts of courage. Most of our children’s images of heroes fit nicely into the molds created by Hollywood and Stan Lee: the classic super hero protagonists. Iron Man, Thor, and Captain America are just a few that spring, or fly, to mind. While the iconic team of Avengers face battles of epic proportions between good and evil, many of our children fail to realize that they are powerful enough to wage a heroic fight of their own. Contrary to their preconceived notions about heroes, they don’t need to be bitten by a radioactive spider or wear colorful spandex to make a difference. Our sons and daughters can be everyday heroes by taking a stand against some of the most harmful forces in their own lives: cyberbullies. Many parents might find it hard to believe that cyberbullying is still occurring, but we need to realize that cyberbullying rates have tripled within the last few years. Now experts believe that 87 percent of today’s children will encounter digital bullying at some point in their young lives. This is heartbreaking for parents, because we want to protect our children from the negative side effects that accompany bullying. In years past, bullying was often left behind at recess or inside the school hallways. Today, however, the technology advancements our kids love have built the perfect playground for bullies to torment their victims from anywhere, at any time. Suddenly, children who are targeted by online bullies have nowhere to hide or seek refuge. Thankfully, there is hope. 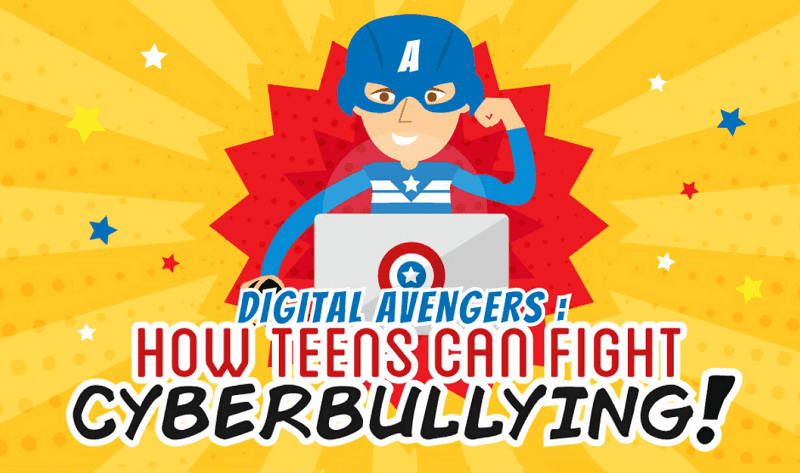 Even though our sons and daughters aren’t immortalized in blockbuster movies, comic books, or bedazzled with medals, they can delete cyberbullying with a tap of a keyboard and without ever leaving home. Studies have found that acts of bullying often stops within 10 seconds if others intervene, especially peers. With a little guided effort, our kids can work to overcome this harmful trend that is facing their generation. Today’s children can go from a silent bystander to an advocate for those being tormented. By making a conscious decision to fight bullying and stand up for victims, our sons and daughters have the abilities to become a real life hero for someone.